You guys have no idea how excited I was to get my own ranting feature. I love to complain! Just ask Ally or Lee―they are forced to hear me whine on a daily basis. To be honest, I don't know why they haven't murdered me yet. The event that inspired this feature happened over a way too short winter break. I happened to catch a few episodes of Doctor Who, and I was hooked. For days I cried and howled for the entire collection of Doctor Who. Lee got so fed up, she found out that the show was available through her Amazon Prime membership for me to watch. (Haha! Another excuse to bum around her house!) So, I guess I'm a whiny brat. But, it makes life funny, so I continue to wail about anything and everything. Alas, Lee has threatened me with bodily harm if I give out spoilers in my reviews. 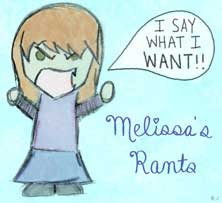 And since ranting requires something to rant about, I have not been able to fully express my book angst. At last! I have found a loophole! Mwahahaha! Do keep in mind that I am a whiny brat and I am only trying to be funny, but I will probably come off as really annoying. So, forgive me in advance. Before I start my book-related rant, I would like to rant about rude people in Walmart. One very innocent Saturday morning, my mom dragged me to Walmart at gunpoint (not really, but close enough). I don't like Walmart, it smells funny. After four days of laborious grocery shopping, we were both ready to make our grand escape. Alas! Some morons were going in the EXIT door! The ENTRANCE DOOR WAS COMPLETELY EMPTY AND NOT EVEN FIVE FEET AWAY! First of all, it IS common courtesy to let people out before you try to go in. Second of all, THEY WERE USING THE WRONG DOOR. Both were clearly labeled, but the asshats apparently couldn't read! Now to the book rant. Oh, and PLEASE use the right door at Walmart. 1. Clara has a brother. Who would have known?! She was so busy with her own drama to give a crap about anyone but herself. Tsk tsk. She wins the Worst Sister of the Year Award. There were plenty of situations that should have put Clara on red alert for her brother's welfare. She couldn't have taken ten minutes to sit her brother down and ask him what was wrong?! But, NOOOO! So, she went ahead and screwed up both of their purposes due to self-inflicted ignorance. To be fair, Clara's turd of a brother could have offered up some vital info. I mean he knew how much trouble Clara was having, and he could have eased her mind by simply telling her that he had his own purpose! Talk about a cry for attention; what a vengeful turd. Well, now that I think of it, that's the only specific example I can think of with actual consequences. But, I'm still right. Things could have gone a lot smoother for everyone if Clara would have pushed her mother for answers. Honestly, I think if Clara had demanded answers, her mother would have fessed up. But, like son, like mother. Why didn't she say anything?! You know what, these people win the Worst Communication Skills Award! Questions in books don't usually bother me, but when the answers are RIGHT THERE and the character chooses to be ignorant, I feel like clawing my eyes out in frustration. Hehe. My review of this book is on the ranty side. I don't hate it, but its got issues. What you said is really the problem - EVERYTHING is entirely too focused on Clara (even Clara). Resulting in the other characters not being fleshed out enough, unanswered questions that could so easily have been answered, and Clara coming off as selfish. And I second the Walmart thing too - Walmart is just stressful in general. It seems whether you're entering/exiting or shopping the aisles SOMEONE is being an idiot! It's like they're in a bubble and don't notice anyone else's existence. The smell thing is funny - I've never noticed my Walmart smelling. Dollar General however - UGH! I do not shop at that store. I cannot breathe in it.